The month of September is always special for Microsoft lovers as Ignite is planed in the month of September for ever year. Microsoft announced few major updates and changes but nothing made Office 365 administrators happier. AdminDroid has surprised its users with a big load of new features. 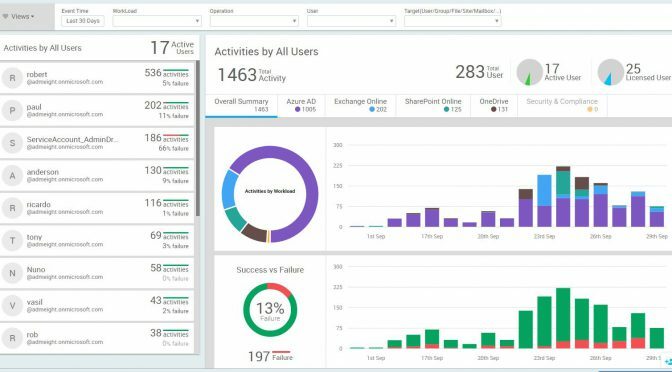 It delivered 50+ new reports, 2 advanced analytical dashboards, and more awesome features with its post Ignite release. 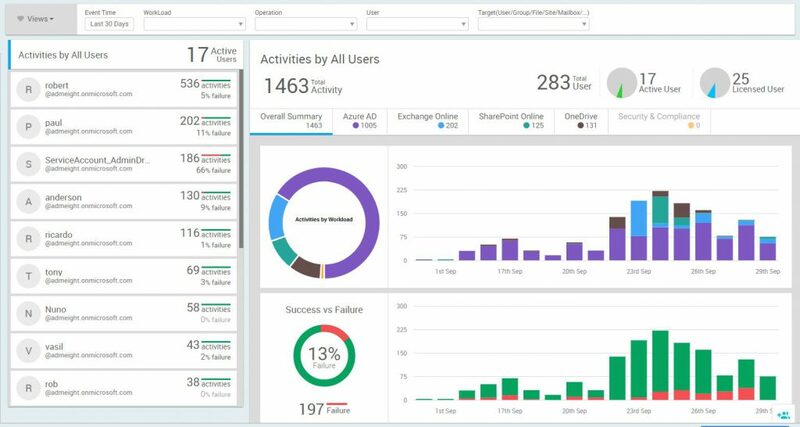 Using this powerful dashboard you can get detailed insights about active users and their activity pattern along with their daily activity trend. We are sure that, after exploring the capability of this dashboard you will never visit Office 365 Security and Compliance Center to perform the audit log search. Find out how many active users are in each department, city, job title, state, country, etc. This update greatly helps you to find how your Office 365 licenses are utilized across your organization. Now every report will have context-specific smart filters. These smart filters will help you to easily slice and dice the huge report data and see only the data which is important for you. AdminDroid now helps you to easily explore your SharePoint Online environment. More than 25 reports related to Site Collection, Site Usage, Users, and Groups have been added. Now it’s easy to get the statistics on your Skype for Business usage. The new reports on active users, conferences, PSTN usage, call duration, file transfers etc. General auditing reports have been added to give an overview of all the activities happening across different Office 365 workloads under a single view. It includes the reports to track sharing & access information of anonymous and external user activities on SharePoint, OneDrive, Teams, and Groups Sites. More detailed blog about each and every feature is on the way. Subscribe to our social media to get updates about our blog posts. ← Now Microsoft Office 365 Auditing is Easier with AdminDroid Office 365 Audit Reports.